At the financial year end, you need to provide supporting Investment Proofs for these investments that you have specified in IT declaration. Till date there has been no standard reporting format or template available for furnishing the details of investment or expenditure proofs. As of now, to claim tax benefits or rebate, an employee has to just mention the sum claimed under exempt allowances. But with effective from 1st June, 2016 to claim income tax deductions you need to submit new Form 12BB to your employer. It is also been made mandatory to submit documentary evidence of your investments / expenditures. 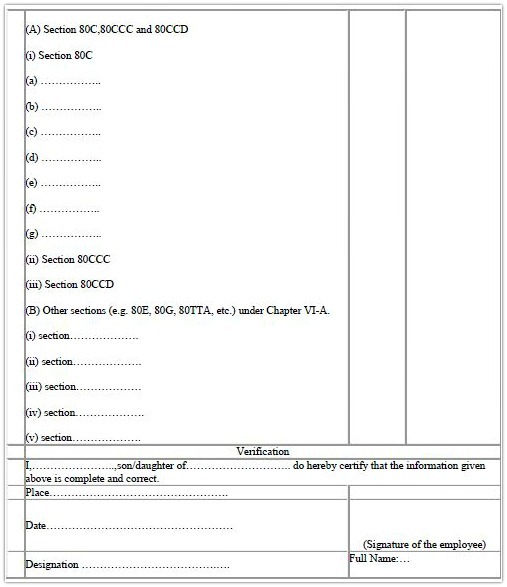 Below is the latest and standard Form 12BB. Click on the image to download Form 12BB. House Rent Allowance : House Rent Allowance is exempt under section 10 (13A) of the Income Tax Act. To claim HRA, you have to provide documentary evidence i.e., Rent receipts. You also have to provide details of landlord (name & address) and the amount paid as rent. Permanent Account Number (PAN) of the landlord shall be furnished if the aggregate rent paid during the year exceeds one lakh rupees. Leave Travel Allowance : With effective from 1st June, 2016, the CBDT has made it mandatory for all the salaried employees to submit travel related expenditure proofs to their employers. Income Tax Deductions under Chapter VI -A: You have to provide the details & evidences of your investments or expenditures related to various sections like 80C, 80CCC, 80CCD, 80D (medical insurance premium), 80E (deduction of interest on education loan), 80G (donations), Section 80EE etc., in Form 12BB. The CBDT has advised the employers to assess the evidence submitted by their employees and then accordingly decide the extent of tax that should be deducted at source from their salaries. I believe that the tax authorities are aiming to bring in consistency in respect of the income tax benefits being claimed and also to ensure that necessary documentary evidence, as prescribed, is maintained while making the claims. My father is a pensioner and he is getting Rs.32,163 as pension through SBH bank account. He has submitted 12BB in 1st week of April 2017 in the bank. In that form, he submitted rent receipts for 96,000 and LIC policies for 26,000.But one person from bank called and said, system is not accepting rent receipts money so only LIC policies are valid for this year. Please tell us what to do as my father does not have own house and he is genuinely staying in rented house. What else investments we can do for tax exemption. Your father can claim rent amount under section 80GG when filing Income Tax Return. Kindly read : List of IT exemptions for FY 2017-18. I have taken departmental home loan from govt of India as I am a central govt employee. While filling from 12BB for income tax, the PAN of the lender is to filled for claiming tax exemption on interest on Housing Loan. What should I write in the column as PAN of the lender (govt of india). Sanctioning Authority of Housing loan is President of India. Dear Sree ..You may check with your employer. I do not have answer to this question. Whether “FORM-12BB” is to be submitted at the beginning of the year or at the end of the year? Dear Naman ..It may depend on employer’s internal HR policies..I have noticed that some employers are accepting forms at the beginning of a FY and some mid-year, and some even in the final Quarter..
Now i am using ICIC bank account with current organization. This message showing for different account number may be different sweep accounts inside same bank account. Why TDS deducted for each quarter ?Can we handle this to not deduct TDS? Have you submitted PAN to your bank? If the interest paid on your deposit account is more than Rs 10,000 then Banks deduct TDS. Why you asked PAN number submitted to Bank? TDS related to this or its mandatory? Thanks for sharing the links and valuable inputs. If the bank does not have your PAN details in its records, they will deduct TDS at 20%. Pan is updated in both the banks. I had submitted my investment proof and details of investment done till Jan’17 with my previous organization. Now, in my new organization, which I have joined in Feb’17, I have to share FORM 12B ans Form 12BB both. Pl confirm if I need to mention entire year savings in Form 12BB or just those which were not mentioned in Form 12B. You can provide your previous salary details and investment details done previously in Form 12B, and the proposed investment details in Form 12bb (for feb/march). I have joined in my new company on 13th Feb and already submitted my form 12BB along with proofs in my old company. Now in my new company they are asking me to submit investment proofs. Can I show this form 12BB to them or do I need to resubmit all the documents again. Also prior company I was not having any tax but now I am falling under tax. Please let me know do I need to submit the medical bills for this year itself. Yes, you can submit your previous salary details & investment proof details to your new employer, they will accordingly calculate your TDS (tax liability, if any). I have missed to submit form 12BB with my employer. So tax has been deducted in this month February 2017. What is the next step to claim my tax ? Is it possible to submit the Form 12BB now and get it adjusted with my next salary ? Same amount of tax will be deducted for next month as well. So please let me know. Once TDS is deducted, you have to claim it as REFUND (if any) by filing your income tax return. i am receiving defence pension and also salary from current employer. Kindly note that Pension income is a taxable income. So, it is advisable you provide those details to your employer, so that they can calculate your TDS (if any) accordingly and issue you Form 16. 1 – Form 12b (Kindly check with your employer). 2 – You can provide both pension income and TDS details to your employer. 3 – I am not sure about From 15BB. I have built a house in the ancestral property in my name and received home loan from SBI. Though the property was only in my name, the loan was taken jointly with my wife. So is it possible for my wife to claim housing loan benefits to deduct from her taxable salaried income. As your spouse is not a co-owner/owner of the property, she cant claim tax benefits on home loan. Kindly read: Joint home loan & tax implications. My renter is asking for PAN card Xerox. I am hesitant due to security reasons. I am ready to provide PAN no. Is it a mandate to provide Xerox as per their company policy. Dear shib ..I believe he can just quote the PAN number in his employer’s portal. But if his employer insists on this then can’t do much. I left my job on May-2016 and joined new company in August 2016. Now new company needs previous compnay tax deductions form 12bb or form16a .I have provided form 16a to my new comonay and i need to submit only 2 months tax deduction for current finacila year 2016 – 2017 .I am checking with previous compnay no one replying for my mail .Is i need to show only 2 months current finacial year for previous company ,if , yes means how i can do it now as i they have rejeceted my previous company income form-16a .what sall i do now to show them ,if i not have proper documents and i not showed anything how much amount they will deduct and how many months they with current finacial year and my previous compnay current finacial year gross salary is 46852 and Total 65857 .After deduction all i will get 46852 gross salary for 2 months current finacial year. I hope someone will help me for my concern with urgent bases. If you have salary slips, you can submit them to your new employer. In case, they do not accept these, you can add your previous company salary details & investment proofs etc when filing your income tax return, along with the current income details. You then have to re-calculate your tax liability accordingly. 1. I purchased flat last year but don’t get possession till date, can I claim principle amount paid through EMI in 12bb. My company not considering this as a investment until possession what to do? Can I claim it while filling ITR. 2. Also my company not considering stamp duty and registration fees in 12bb, what can I do? I paid stamp duty and registration fees in last year but not claimed, can I claim this year while filling ITR. 1 – No. (assuming last financial year). 2 – No. If it is still in under-construction stage, you can not claim tax benefits. 3 – Kindly let me know the date of payment. Kindly read: Under-construction property & tax benefits on home loan. IS there any due date for submitting 12BB and LTA documents for FY16-17? I live in a temporary accommodation and I dont have any rent receipts or legal agreements with me. Can you suggest what kind of documents/evidence I can submit to avail HRA benefit? There is no specific due date as such..generally employers do inform their employees on the cut-off dates. PT 208/- Per Month is it mandatory ? If your income is below basic exemption limit and no TDS is deducted by your employer then Form 12BB is not mandatory. But, suggest you to submit it as you have HRA and you can file ITR with NIL tax liability. Dear kishore ..As it is in your mother’s name, you can not claim the tax deduction u/s 80c. There is a column if form 12BB in HRA section that asks for address of landlord. Will it contain the address of rented accommodation as mentioned in rent receipt or the landlord permanent address? Dear Vishal..I believe it is permanent address of Landlord. I have submitted very few documents with form 12bb to my employer. Even HRA also not submitted. I have made some more investments after 12bb submission. Is it okay to submit HRA and other claim while return filing? Yes dear Praveen , you may do so. Kindly read : IT declaration & investment proofs. I have travel bill for june 2016 but i didn’t claim in 2016 calender year , Can i claim that in jan 2017? In this Jan 2017 i am planning another journey so i was thinking if i can claim both the travels in this Jan 2017. Please clarify is it possible? Kindly note that Exemption is allowed for only two travels within a block of four years. The current block is between 2014-2017. If the individual doesn’t take advantage of the exemption within this block, they can carry it over to the next block. You may just submit the bills to your employer and they will consider for respective allowances. Kindly check for these amounts when you receive Form 16. Suppose if i do another tax saver FD in the month of feb 2017 or march 2017 , Can i use the second FD while filing the IT return to claim the tax paid . Dear kishore ..Yes, you may do so (subject to ceiling limit u/s 80c). Now except the Life Insurance all the other investment made is online and I don’t have any clue as what proof to provide as to avail the exemption? 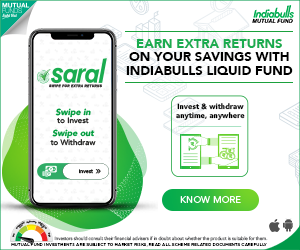 Does ELSS & SIP is under 80C? And what about the PF? that’s also under 80C? and do i need to mention about the PF on Form 12BB. Kindly note that SIP is a mode of investment and not a financial product. You can get Mutual fund statement for ELSS and can claim tax deduction u/s 80c. (You may ask your online service provider to share the MF statement). Yes, PF can be claimed u/s 80c and can be mentioned in Form 12BB. Read: IT declaration & investment proofs! Could you please confirm whether 12BB form should be filled with the amount which is paid till December’16 month. Should we mention full amount that includes till Mar’17 which is yet to pay. Please clarify. You can declare for full FY, it all depends on your employer if they are ready to accept it or not. Generally they do accept. I changed my company in November 2016. I provided the tax declarations in Form 12BB and submitted it to my new employer. There is a section in the Form 12BB called “Previous Employer Income”. I do not know what I was thinking, I just multiplied my monthly salary from previous employer by 12 (months) and entered the same there. Now, my current employer has just added it to my gross salary and deducting tax , which is resulting in quite a few thousands as tax. My previous employer already deducted tax for my previous month salary. So, why am I being taxed again for the same amount. I am just hoping someone can help me on this forum. You should have given income as well as TDS (deducted by ex-employer) details to your current employer. Nevertheless, you can claim excess TDS (if any) being deducted by your employer when you file your Income Tax Return for AY 2017-18. Read: Income tax declaration & proofs. I am paying a rent of 21,000 per month since 22 aug 2016 (non metro)but the issue is the owner resides in US from long time and doesnot have a PAN number and they are ready to sign the declaration that they do not have PAN number. how do I proceed, I only see one optuoin i.e. to reduce the declared rent to 8333 per month. Can you please suggest the step forward. I have the exact same query. The landlord is in US and has never had a PAN. he is willing to give the declaration, but my company’s finance team suggests that i reduce the HRA amount to 8333/-. This would result in huge taxation! Is there any indication from the govt that PAN is mandatory and declarations wont be accepted? Also is Form 60 something that can be used in this case? I believe that ‘declarations’ by landlords are still being accepted and I am not sure if there is any latest/modified notification on this. Basically this is a compliance measure by your employer(s). So, you may have to reduce your HRA or convince them about declaration (if your case is a genuine one). I am filling my Tax proofs at my company. They are asking for PAN of Bank for Interest Paid on Housing Loan ? How can I get this info. You can contact your banker and get the required info. I have cleared my home loan due(per-payment of balance Rs. 6,74,000) in June 2016. Can I claim HRA as tax benefit now in my tax proof submission. I have declare my home loan interest/principal at the time of IT Declaration. You can claim HRA for the respective period. I have a query regarding the HRA , kindly clarify if the employee has stayed in two different houses in a single financial year and the total input is summing up to 1 lakhs, but the individual landlord sum is not exceeding 1 lakhs, in this case whom pan details should the employee get ? I believe that you need to declare both PAN numbers respectively. I have recently joined a new organisation. I wanted to submit my investment declaration as per form 12BB through a third party HR portal. I pay a rent of Rs 15000/- PM to my land lady (old). But she doesn’t has PAN number. Can I declare pan not available in PAN field of land lord? I tried, but it is not accepting the entry. Can you guide me on this issue? You need to contact your Service provider or Employer if they can accept the (if the said application has such provision) Self-declaration given by the landlord/lady that PAN number is not available. Dear Rankit ..As per my observation, most of the employer are now insisting on submission of Landlord PAN number. So, advisable to convince the owner of the property to get a PAN (if does not have) or to provide the details (if he/she has..). Self-declaration document by landlord is declared. Also, kindly note that TDS on rent payable to NRI has to be deducted by the tenant. I have query regarding lender information. What would be the lender information(Name,Address & PAN) in case of ‘loss on let out property’. It would be bank information from where we have taken loan or it would be the information of person to whom we have let out the property. Lender, here refers to the lending institution from where the loan has been taken. If its lending institution is a bank how to know their PAN number? Dear Vadivel ..One can get it from the respective/concerned Lender or banking institution. My query is, what will be activities (processes) of the employer on form 12BB submitted by the employee. 1. Will it be submitted to Tax department along with 24Q? 2. what data from this form will be included in 24Q? 2 – Your investment details (tax deductions) & allowance claims will be provided in the Form 24Q. Kindly note that Form 24Q has details of salary paid and TDS deducted from employees. I would require a little more information on this. Can you please answer below questions? 1. When this form 12BB needs to be submitted by Employee to Employer? 2. What if employee update 12BB every month then Employee is required to submit Form 12 BB every time?? 3. Do Employer needs to keep all Form 12BB or the latest copy submitted when actual proofs submitted? 4. How employee can submit actual proofs at starting of FY because either he is planning to invest or payment date is due?Given the fact that it is provisional statement. 5. Previous year premium paid slip can be used as proof in starting for current FY?Given the fact that it is provisional statement. Can we extrapolate/anticipate the expenditures based on previous years? 1, 2, 3 , 4 & 5 – There is no specific date or month as such, depends on the Employer’s policies & guidelines. I had been working in an organization from April to September 2016.Tax was deducted when i came out of the office.But i have documents like HRA,home loan and medical bills. How to claim the amount which has been deducted? Is current employer can adjust the amount for the whole year? Firstly, you can submit the income details of your ex-employer to your current employer. You can also submit investment details to your current employer. HRA can be claimed when you file your income tax return. Medical bills can not be claimed with your current employer. Home loan deduction can be claimed. Good evening.Please guide me, I am Living with my Parents and the Property is in the Name of my Grand Parents. Now for to Claim HRA, can I pay money to my Father as a Rent and claim it. And He has the PAN card but haven’t fill ITR till now (Age 67 yrs), so in this Case if Required his PAN to mention ? If the property is in the name of your Grand parents, you can pay the rent to them. Yes, you can quote your grand father’s PAN card num (as your landlord). In case if the rental income to your grand parent is more than the basic exemption limit, he has to file his income tax return. Thanks for the reply , however my Grandparents are no more and the Property is combined.Now in this case can I claim on the name of my Father . And he has on pension of 15 K per month having PAN account but never fill ITR till now. Dear Vishal ..Yes, you may do so. But the suggestion regarding filing ITR remains the same. If Mr.Vishal has an apartment in the same city, which is let out. Can he claim HRA? If it is a let-out one then he can claim HRA. I have seen visited your blog and found no of view points and valuable information regarding the saving and Investment. In my case I need your advice as I am also working in private organiosation and pay HRA of 14k every month to my landlord and he is very smart and refuses to share his PAN details, neither he accept any NEFT transaction and becase of this issue I can only claim 8333 /- rs per month tax relif instaed of my campany will provide me HRA of 11k as per my present designation. I will be very thankful how we can handel this sitiuation of take some action of such type of Blackmoney creator landlord. Dear Sandeep..If he is not providing his PAN details, you may try finding a new rental property, isn’t that a better option?? Thank you for the information. I live in hostel and get receipt for rent paid. I am salaried employee (HRA is not included in my salary). Can I claim HRA? How much? If yes, would I have to give it to my employer or I can claim later when filing return? If you pay rent and do not receive HRA as part of your salary, you can still claim the tax deduction under section 80GG. To claim the tax benefit under Section 80GG, you must pay rent for the house you live in, and not get HRA for even a part of the year. Also, you should not own any Self-occupied house. Actual Rent less 10% of Income . I just wanted to confirm if it is applicable to hostel too. I guess the answer is yes. Dear Jyoti..In case landlord does not have PAN, then he needs to give declaration. You may encourage and convince him to apply for PAN. How and where should we get the adress and Pan of lender(in case a housing loan is taken, and the lender is a bank). Dear Vishal ..You can request your lender (bank) to provide the required details. sir, i am a worker in a private firm, with the salary of 25000 per month. but i dont get my full salary due the leaves. my ofiice is seeking me to fill the 12bb form. if every month tax will get cut from it, it will be very low income for me to survive in delhi, as i have to send money to my family too. can you please suggest me anything? i live on rent, and dont have any lic policy and what else. My house owner does not have a PAN, I believe it is mandatory to submit 12BB with PAN number of the landlord if the rental income exceeds 1Lakh. In case landlord does not have PAN, then he needs to give declaration. Encourage and convince him to apply for PAN. Is declaration by landlord still valid? In form 12bb, they mentioned only have to get PAN if HRA exceeds more than 1 lakh, they no where mentioned or landlord has to sign a declaration. Every one has this question in mind and few employers are not accepting declaration. is there any rule change? I believe that delcaration by landlord can still be considered as ‘documentary evidence’. But it depends on Employers’ policies and guidelines. I guess there is no new update on this from the IT dept though. Hope the exceptions U/S 10 can not be claimed while doing the ITR. Please correct me if I’m wrong. Allowances like LTA & Medical allowance can not be claimed, however I believe that HRA can still be claimed when filing the ITR. 2. If, the amount is added then how I can claim LTC amount in ITR? Dear Alam ..Kindly check if LTC is given in your Form 16 (u/s 10). Dear Alam ..You can not claim LTC/LTA now when filing ITR. It should have been included in Form-16 issued by your employer. You can declare both in Form 12BB. May be you can enclose one more Form 12BB to it and let your employer know this. Form 12BB has to be filled at the beginning of Financial Year (FY). At the beginning of FY, I’m entering only House Rent in Form 12BB. If I open an LIC or PPF at the mid of the FY, how to add it in Form 12BB? I believe that you can submit one more Form 12BB if your employer can accept it. Else, you can claim the tax deductions when filing ITR. As per new tax rules can I submit declaration if owner do not have pan card? I am not able to get this information anywhere. Please someone clear this doubt. Kindly note that the ‘declaration form’ has to be filled and signed by the Landlord. How does one produce PAN of Housing Loan lender when the loan is taken from a BANK? How does one produce PAN of Housing Loan lender when the loan is taken from a financial institution? Dear Ranjay ..Is it compulsory to submit? I am not aware of this…. In case of “Income from house property”, it is mandatory to mention the PAN of bank or financial institution. If you do not have this information currently, please approach to the concerned bank or financial institution. For the current month, you can mention the ‘PAN of lender’ as PANNOTAVBL. Thank you dear Yashwant for sharing your inputs. Kindly keep visiting! I am staying on lease. Can you please confirm how to get HRA tax exempted. Dear Jyoti..If you are receiving HRA in salary. If you have paid the lease amount for the entire period, calculate it Financial Year wise and request your land lord to issue a separate receipt Financial Year wise and can produce the same to your office. This form 12bb is submitted monthly, qtrly or yearly. Dear brijendra ..Depends on your employer’s policies. Ideally on an yearly basis..
What is to be done if my EX-Employers(2 of them) have till 2nd July.2016 NOT issued me my Form16 for FY1516/AY1617 despite several Reminders? And if the forms are not issued by then, under section 272A(2)(g) of the I-T Act, the employer is liable to pay a penalty of Rs.100 per day of default till it issues the form. Employees can approach the accessing officer (AO), under whose jurisdiction she has to file her ITR, and give a written complaint against the defaulting employer. Based on the complaint, the AO may take appropriate action or initiate penalty proceedings against the employer. What issues can arise if I issue Rent Receipts to my Retired Father Sr.Citizen who has no regular source of Income? Dear TVS..Who owns the property? If you issue the rent receipt then how it benefits you? I have an agreement with my Father to “rent” out a part of the Flat to me for which I pay Rent either Monthly or as an when possible from my Income. sorry for the error in relating to you. My Father is the Owner of the Property and SO my father will be issuing the Rent Receipts to me for occupying a portion of the Flat in Mumbai. What will be the benefit in my HRA Calculations and is this valid claim for exemption in my IT Calculations? I also have a standard Rent Agreement (not stamp Paper but on Ordinary Paper) duly witnessed by 2 neighbours. Is this Ok? Dear TVS..Yes you may do so. You may also have to provide your Father’s PAN number to your employer while submitting the proofs. Also, your father has to show this as rental income while filing his tax return (if any). So nothing illegal on that score I presume. If my employer has forgot to include my HRA in the Form-16,how can I get the refund for the HRA? Can I include it in my ITR and get a refund for it? If you live on rent and have made rent payments, you can claim deduction on House Rent Allowance at the time of filing your return. i want to know that in respect of Leave travel Concession and deduction of interest under the head “income from house property” whether employee need to submit the respective document at the time of submission of form 12BB or at year end. and if employee sumbit respective document at year end then can employer claim exemption. Dear Sunil..It depends on your employer’s policies. I believe that you can submit Form 12BB now and the documentary proofs at the year end. Kindly check with your employer too. >>It is also been made mandatory to submit documentary evidence of your investments / expenditures. It doesn’t say when. So it will be useless to say that you have to do it as soon as possible to support your tax deductions for the rest of the year. Also, that is why the Form 12 BB itself says evidence/ particulars. & not only evidence. if the legislative intent is to furnish only evidence then it wouldn’t have used the word “particulars”. -LIC premium can be paid at the due date only ( if it is due in the Feb 17 why pay now). -Claiming benefit of interest or principal re-payment of Home loan etc. -Also in claiming benefit of Leave Travel Assistance (LTA), do you think employee needs to under take journey and furnish proofs of travel now. So, it is very much clear that employees need to furnish particulars that state the nature of evidence which can be furnished in Form 12 BB now, and proofs later on (obviously before the end of financial year). Dear Jagatveer..thank you for sharing your viewpoint, which I believe is logical & acceptable. Please remove this line from your blog as it is misguiding and people in my company are actually following the same without going to the details themselves. You can just guess how irritating it is for me because I am an engineer and doing the research that they should do. So even if it is important for you to reflect your view point of the theory, please write it so (don’t call it a mandate). Or present both sides of the coin and let people decide. It will be very appreciated if you update the blog, because I have checked with many companies like IBM, Quark etc and they all are going by the same old fashioned tax declaration stuff. Yes the new thing is the form which they obviously use. Kindly go through the below sentences which are copied from The Finance Bill, 2015. 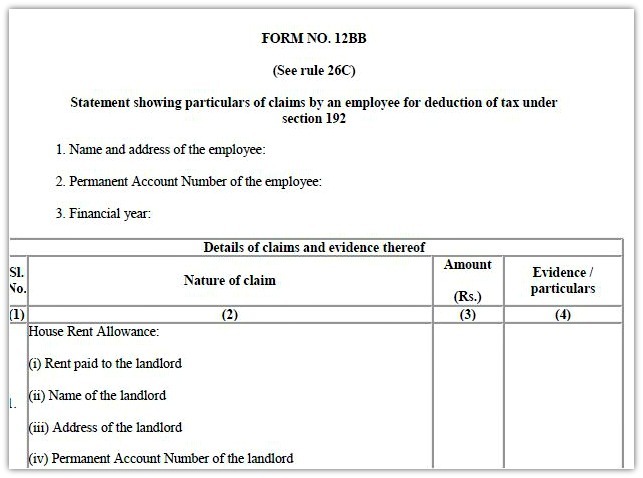 “Section 192 (2D) : The person responsible for making the payment referred to in sub-section (1) shall, for the purposes of estimating income of the assessee or computing tax deductible under sub-section (1), obtain from the assessee the evidence or proof or particulars of prescribed claims (including claim for set-off of loss) under the provisions of the Act in such form and manner as may be prescribed.”. This is a compliance requirement. So, it is up to an employer to follow it or not. It doesn’t say when you have to submit the evidence of the investments for tax benefits. The point is simple, follow that has been said to change. Where there is no change mentioned in the writing, it’s actually wrong to just assume it and start following it. For example, Government wants us to use the new form 12BB, fine we should use it. Similarly, Government has not mentioned anywhere that you have to give the evidence of the investments in the beginning . So we should definitely not let our imaginations run wild. That is why the Form 12 BB itself says evidence/ particulars. & not only evidence. So, the sentence in the blog – “It is also been made mandatory to submit documentary evidence of your investments / expenditures” is ok, am i right? As it talks about proofs and does not say about the time-line. As mentioned in my previous comment, it is up to an employer to adhere to the compliance requirement or not. Ok, I guess you are enjoying it too. However, just when you clarify the line from your blog, you have given another controversial statement. If there is any tax laws updates, it’s mandatory for everyone to adhere to it if it applies to you/your business/income(obviously if taxable). So it being up to the employer if something applies to their kind of business is wrong. You have quoted few company names which are not adhering to the requirement. So I have mentioned that it is up to them to follow the rules or not. But if caught they may have to face the CONSEQUENCES. I am only trying to point out that ‘evidence needs to be submitted’ in the prescribed manner (Form 12BB) which you too have agreed in your last comment. So WHEN to collect them may vary from employer to employer. Yes I agree that the new form is to be implemented. When to collect is only when the investment is made. Till then the tax declaration is sufficient, per the new form. And try to read the sentence for the name of the companies. They are just not being stupid to follow anything that is never said (forcing people to give evidence in the beginning ). They have read it well and have properly implemented the things that are meant to be implemented per the new change. so they ARE following all the rules. It is just that they have a good finance team, who actually investigate things and not rely on someone else’s view point of the stuff. But not all companies are that smart. And then people suffer. However, people are going to take you by word because You are in this profession and I an Not. And this is why I am poking my nose in everything you say that can be interpreted into something else. I have a doubt About 80C and rent receipt. I am planing to open o PPF account this year, but have not opened it yet. So How do I provide document for that this quarter? My landlord do not provide me with the rent receipts also he refused to create rent agreement . what should I do? Thanks for providing information. I have one doubt, I have a RD account can i get tax benefit on it and under which section i can declare it. Dear Sagar..No tax benefits are available. My CTC is 6.6 Lakhs per Annum (Have 5 years old Daughter and 11 months old Son). Can you suggest me regarding Declarations..
Tax Treatment of various Financial Products. List of Income Tax Deductions AY 2017-18. It is a traditional plan. Suggest you to buy a term insurance cover (if you do not have one) and then can discontinue this policy. i purchased house through home loan, but now it is vacant. Where i show this details in form 12bb. I am already staying in rental house. Dear swetha..Yes you can put rental income as zero and show the house as a ‘let-out property kept vacant’. You can claim interest payments on home loan under section 24. Income from house property & home loan tax benefits. IT declaration & investment proofs! Hi Shreekanth, My doubt is do we need to submit evidences along with form 12BB? For some of my declarations, for ex life insurance premium/PPF, what if I have not paid it yet. How do I provide the proofs. Dear Preeti..Yes, you have to submit documentary evidence of your investments / expenditures. You can submit last payment receipts, that should be fine. Dear SOUMEN..Yes you may do so. Hi shree a great article again. ..couple of doubts. 1 . The form 12 bb is applicable from 1 jun 2016.Hence while submitting IT returns this year do I have to submit anything?? 2. I have to claim refund under 80 C wherein I have paid premium of LIC policy but had not declared it earlier.Now do I need to submit the receipt or not?? 1 – There is no need to submit/enclose any documents. 2 – Not required. You can mention it in your ITR and calculate the tax liability (if any) accordingly. IT Declaration & Investment Proofs. Dear Krishna..You may just click on the Form 12BB image to download it and then you can take a print of it (if required). I have one doubt about the Form 12BB.Does it have to be a physical(Hard) copy or can the employee submit a soft copy. Dear Balaji..The format has been provided and the submission to the employer can be online/offline, kindly check with your employer. My Landlord did not have a PAN last year and hence gave a declaration, does this hold good this year or what is the process? also regarding the income from capital gains on sale of shares if its tax free after year , is it still taxable in the hands of the investor? if such is the case then is it possible that person can fully be invested in tax free bonds for monthly income over the tax limit specified. that is say if his income is purely from tax free bonds and sale of shares (after one year). Eg. say if the annually income is say around 4 lakhs, then he wont have to pay any tax as it is from tax free bonds ? 1 – No, it is not taxable. 2 – Yes. But can be reported this in Exempted Income Schedule. I recently came across your blog and found it very very useful. Keep up the good work your doing , may the Parmatma bless you and reward you for this valuable service to Bharatiyas. 1) Suppose a individual is earning yearly income from tax free bonds which amounts to above the 2.5 lac taxable limit , does it mean that there is no tax at all to be paid on interest income (in the hands of the investor) from tax free bonds even if its substantially above the taxable limit for individual? This is assuming there is no other income earned by the individual from other sources . 2) in a Bond fund what is done by the fund house with the interest income earned from the bonds purchased, is it paid out as income or is it reinvested? Similarly for the dividends earned by the Equity funds on the various shares they own in name of investor, how is it disbursed or is it reinvested? 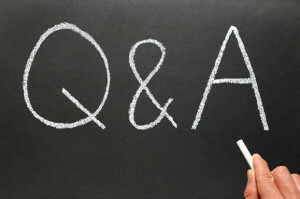 I will appreciate if you can provide answer to my above queries. 1 – Ideally the interest income from Tax Free bonds can be shown under ‘Exempted Income (ET)’ schedule of ITR. 2 – It depends on the ‘growth’ or ‘dividend’ option that an investor chooses.